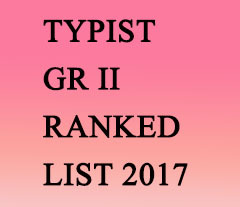 The following is the ranked list of candidates for the post of TYPIST GR-II(RE-DESIGNATED AS COMPUTER ASSISTANT GRII) (SR FROM AMONG SC/ST). - (Statewide) on `10,480-18,300/- in FINANCE DEPARTMENT, found suitable by the Commission and arranged in the order of merit based on the OMR Test held on 05/02/2016. This Ranked List is brought into force with effect from 01/08/2017.